The 10 Best Dog Water Bottles are affordable and designed to meet your dog’s needs. Hydrating your dog is very important to a long dog life and a happy dog. Enjoy this list of dog water bottles. #1 on this list of 10 best dog water bottles is the Petmate 24494. This particular bottle is made out of Polyethylene terephthalate (PET) and is a common plastic bottle type for containing beverages. This dog water bottle comes with one filter which is not necessary to use, depending on the quality of water that you put in the bottle for your dogs. This bottle is 1 gallon in size and automatically replenishes the dish that your dogs will drink out of. The water bottle will not disperse water until some has been drunk by your dogs. Depending on the size of your dogs this bottle could be filled once a week or less. The best part about this water bottle is that it is easy to clean and refill. The con with this water bottle is that you will probably spill water when you refill the bottle and place it on the dish, since you have to turn the bottle upside down in order to put it in place. One of the 10 best dog water bottles for traveling is the H2O4K9. It was recommended to me by a fellow dog lover. I’m sure that you and your dog both love to go outside and play, and you both get thirsty. If you are out and about with your dog hiking, this is the perfect bottle for your dog. Both you and your dog can drink out of this water bottle. 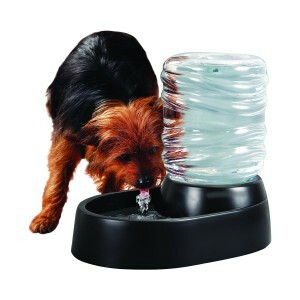 It comes with a detachable lid that makes it very easy for your canine friend to drink the water that you pour into the lid. The bottle is tough stainless steel and BPA free, much safer and durable than plastic bottles. The only downside to this bottle is the size. 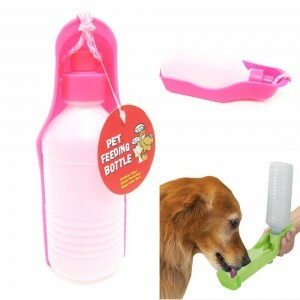 It is 25 ounces, which should be enough for your dog, but it could be burdensome to carry with you since is is larger than a regular 16.9 ounce plastic water bottle. This bottle however has a loop at the top to attach, but you would have to provide your own clip to attach it to your backpack or other carrying device. This bottle could easily fit in your car’s cupholder or anywhere else that a normal size bottle will fit. I would recommend this to anybody that travels with their dog. I found a much cheaper comparison to the H2O4K9 dog water bottle. This bottle is much smaller at only 10.14 ounces and made of cheaper plastic and rubber. If quality is not an issue for you, but price is, then this may be the bottle for you and your dog. The benefits of this bottle, other than the price, are the fact that it comes in many colors and, unlike the H204K9, it has a convenient rope that is attached to the lid to make it easier to carry and it is smaller in size as well, adding to its convenience. Honestly, I would rank this dog water bottle towards the bottom of the list for the 10 best dog water bottles. At a whopping 3 gallons, this should be a big enough dish to hydrate more than one dog, or a really big dog. This bottle is also BPA free which is safe for your dog. My only concern would be that the dish seems to be rather small for a big dog to get his mouth in and drink out of. This dog water bottle is the most expensive of the 10 best dog water bottles that I have reviewed thus far and the only electric one. 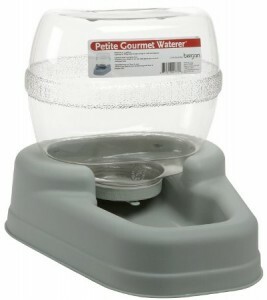 It can hold 62 ounces of water total, which includes the water in the bottle and dish combined. That is 2 ounces shy of one gallon. The nice thing about this bottle is that the water continues to flow like a stream instead of remaining stagnant and filthy, with your dog’s hairs and other debris that might fill a dog’s water dish. The description of the product warns against filling the bottle too full and placing it on a flat surface. Another electrical dog water bottle that is even more expensive that the previous one, yet larger than the previous at 168 ounces (1.31 gallons). This electric fountain looks very cute and functional. It comes with a carbon filter and is BPA free, clean and healthy for your pet. Replacement filters can be purchased separately. The cool thing about this water bottle is that it imitates a running faucet for your pet to drink from. It appears very easy to refill as well. Since hydration is very important to living organisms, such as your dog, this is a good way to encourage your dog to drink more water. Drinking more water will improve your animal’s life and good for their organs and kidneys. This dog water bottle is about the same as the other bottles, in particular, the Petmate 24494, but much larger. In the title of the product on Amazon it says 4 gallons, but in the description of the product on the same page it lists this bottle as holding 5 gallons. Either way, this is much larger than the other dog water bottles that I’ve reviewed. Do you plan to be away from your pet for a long time, such as a long day at work or a short vacation? Then this bottle may be for you and and your dog. Due to its larger size it can sustain your dog longer. This dog water bottle is an interesting one because it looks more like a hamster water bottle. It is also about the size of a hamster water bottle, since it is only 300 ml or 10 ounces. I would only recommend this one for small dogs, yet this one is one of the easier ones to fill and set out for your dog. It comes in two different colors, red and white. This seems a little expensive to me, considering it isn’t very big. I imagine this would be a good bottle to hang in your dog’s catch while you’re away, sleeping, or taking it to the vet. This bottle however would be much to small for any big dog and I would really only recommend it for a very small dog. The water bottle has clips that should be able to attach to your dog’s cage, but I don’t know where else you could possible hang this dog water bottle for your dog to drink. This dog water bottle is better than the previous hanging water bottle for a couple reasons. Number one being that it is 44 ounces, over 4 times the size of the previous hanging bottle. It claims to be no drip, meaning no spilled water on the floor or cage. 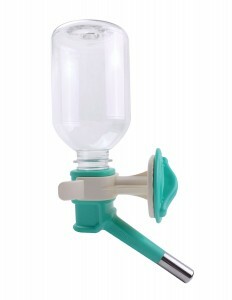 It also has a flip up top to the bottle for super easy refill. This bottle is definitely meant be clipped onto the inside or outside of your dog’s kennel and the description on Amazon says it comes in various colors. For actually less money than the previously listed “Water Dispenser Dog Kettle” this holds way more water, therefore more value for your money. This bottle is brand-new and US patented, with a leak-proof nozzle and is also BPA free. It only costs a little. The cool thing about this bottle is that you can place almost any PET water bottle that you like into the nozzle, so therefore if your animal needs more water, just screw in a bigger bottle.